Is it against NCAA rules for players and parents to talk to agents? No – It is not a violation of NCAA rules if a student-athlete merely talks to an agent (as long as an agreement for agent representation is not established or nothing of value is giving to an athlete) or socializes with an agent. For example, a student-athlete could go to dinner with an agent and no NCAA violations would result if the student-athlete provided his own transportation and paid for his or her meal. Will NFL teams or scouts provide their spring grades on the player from the two scouting service (BLETSO & National)? No – The scouting services (BLETSO & National) keep their information private and do not share it with players, parents, coaches, agents, trainers, etc. Does the information leak out there from time to time and are people able to get their hands on it, yes but it doesn’t come from the two organizations directly. How do BLETSO and National come up with the spring grades? Both scouting service will come in the spring and evaluate the upcoming senior’s by watching film of the prospects junior year, talking to the strength and conditioning staff, the coaching staff, and the academic staff at the school about the prospects. 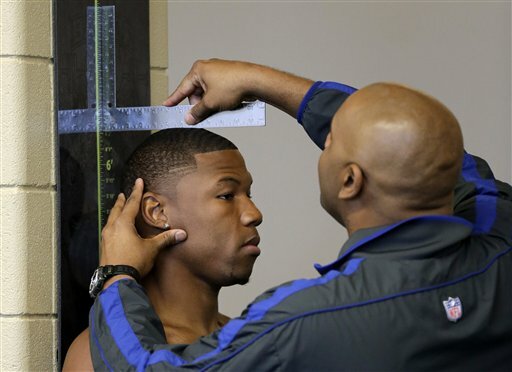 Some schools allow the scouts to come in and measure the prospects height, weight, hands size, arm length as well as have the prospects take the Wonderlic Test. Some schools will even allow the scouts to time their players in the 40 yard dash, but very schools will allow this now. Can players, parents and coaches contact the College Football All-Star games to recommend a player for the All-Star game? Yes – Anyone can contact the All-Star games (Senior Bowl, East West Shrine Game, NFLPA Bowl, etc.) to recommend a player and the sooner the better to make sure the player in on the games watch list or at least on the games radar that they would be interested in playing in the game. The best person to contact is the director of the game. How does getting invited to the NFL Combine in Indianapolis work? National Scouting Service, one of the two scouting service that NFL team use run it, they have a committee of 10 members and they vote on the players that are selected. Having a good spring grade goes along way to getting selected because spring grades are a road map to where NFL scouts are going to go and watch and evaluate prospects. When can a player sign with an agent? When his college eligibility is totally done (after last game, and college team has no more games) as a senior or if a player is going to declare early for the NFL draft he has to be 3 years removed from high school and once he declares for the NFL Draft he forfeits the rest of his college eligibility. What is the maximum an agent can charge from the player NFL contact? Per the NFLPA rules the maximum an NFLPA Certified Contract Advisors (agents) can charge is 3% – The agent only get paid after the player get paid off of the players signing bonus or other bonuses in the contract and the base salary. What is the normal commission fee for marketing and off the field money made for the player? Agents or marketing firms usually charge between 10% and 15% commission on marketing and off the field money. Does a player have to hire an agent? No – But NFL teams are only allowed to talk to NFLPA Certified Contract Advisors that represent the player or the player themselves. They are not allowed to negotiate with family members or other non-certified people and if they do the team could possible lose future draft choices. How does a player sign with an agent (NFLPA Certified Contract Advisors)? They player signs what is called an SRA (Standard Representation Agreement) that is from the NFLPA and is standard for all players. By sign this is also makes the player part of the NFLPA and Players Inc. (The marketing arm of the NFLPA). At any time the players can fire the agent and has to wait 5 days to hire another agent to represent him. What are the steps that go into getting a Senior prospect final grade? First and for most College Football All-Star games are a business, they need sponsors to help take care of the expenses to bring in the NFL Draft prospects. These sponsors want their brands to be associated with the NFL without having to pay the top dollars to be an official sponsor of the NFL or a competitor of their already has that category locked up with the NFL. So to get true NFL prospects is a must to be able to help keep sponsors coming back year after year. That is a major selling point to sponsors is how many draft pick you had or how many players you have in the NFL that played in your game. When the spring grades come out from BLETSO and National not only are the agents and financial advisors try to get their hands on them but so are the people that run the all-star games. All-star game directors of player personal want to see if the players NFL spring grade matches up to what they think of the NFL prospect. When I was in that position in charge of personal we built our boards like we were an NFL team. We wanted to make sure we could get the best prospect in our game as possible. Any game not named the Senior Bowl knows it has to more work on elevation because since the Senior Bowl is far and away the number one College Football All-Star game. If a player is going to play in an all-star game and get an invite from the Senior Bowl he is accepting that invite. 1. Is he a true NFL prospect: Does he have the ability to play on Sundays and is not just a good college football player? What are scouts saying about him, will they want to see more of him in a college football all-star game setting? What grade do you have on the prospect ? As a director can you defend the selection to NFL scouts if they ask. 2. Does he have NFL measurables: If there is a tie between two or more prospect for a game roster spot, directors will go for the bigger, longer player. 3. Where the player from: Since the game is a business it doesn’t hurt to have a few local or regional prospects to help with media coverage and ticket sales. 4. What agents are recruiting the prospect: What kind of relationship does the agent have with the games personal director? Is the agent truly trying to help the prospect or just help him if he signing the prospect? Is the agent using one all-star game invite to help the prospect get a “better” invite? 5. Is the college coach calling for the prospect: Will his college head coach or position coach pick up the phone or send you an email recommending him to the game? We would always have his happen and it did factor into our decision making process. At the end of the day the College Football All-Star game process is a big part in which a prospect can raise his draft stock so as a director of player personal you want to make sure you get the best possible prospects into your game. As we push towards the start of the all-star game season (Senior Bowl, East – West Shrine Game, etc) as an NFL Draft prospects you will start to get interview by what are called “College Scouts” from NFL teams. These guys’ jobs are to gather information both football and personal related, evaluate your play and write up scouting reports that can be reviewed by their team’s coaches and front office. “Pro Scouts” on the other hand evaluate current players in the NFL, as well as players in the CFL, AFL and other leagues. Before pre-season rosters get cut down to a team’s 53 man roster these scouts are evaluating each player on the other 31 roster so if that player get released they have a “pro scouting report” on that player. 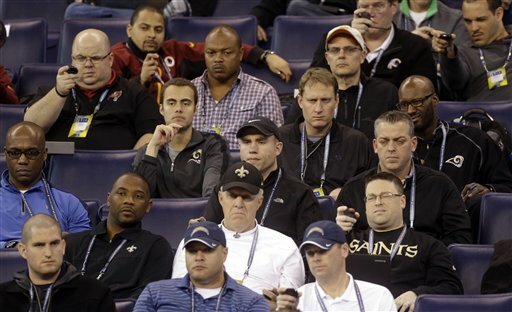 Each NFL teams has much more College Scouts then Pro Scouts on their staff. In the past when a player get released I have heard them saying well this scouts from a certain team really like me before the draft. After the draft is over college scouts have little to no impact on what an NFL teams does in training camp or in the season, because once the draft is over their cycle looking at next year’s draft prospects starts. As a prospect you need to know that when/if you gets released that your agent (you if you are representing yourself) need to contact the teams Pro Scout to get a work out or get signed. When the NFL Draft comes around every April every college football player that is eligible is hoping that they will get drafted somewhere in the 7 round draft. With over 1,500 eligible players and only 256 draft slots that can’t happen. After the NFL Draft teams will sign undrafted rookie free-agents and it gives them an opportunity to make the teams 53 man roster, some other teams 53 man roster or a practice squad. With the NFL season about to kickoff let look at the impact that undrafted rookie free-agents have on NFL rosters. As of September 7, 2016 there is 478 players on a 53 man roster that where not drafted. So 28% of the 32 NFL teams 53 man rosters are made of undrafted free-agents. 61 of these players are rookies. There are 240 undrafted players that are on practice squads. Teams are allowed a max of 10 players on a practice squad, so 75% of the NFL’s practice squads are made up of undrafted players. NFL teams spend millions of dollars on scouting players for the draft but they are unable to be prefect in their selection of players. When the draft comes everyone has an opinion on what players will get drafted and who will make the 53 man roster but the NFL business is unpredictable and that is one reason why people love it. In the past few years social media has exploded and more and more corporate America is reviewing candidates for jobs social media profiles and making hiring decisions based on what they find on someone’s Facebook, Twitter, Instagram, Snapchat, etc. This has now made its way to the NFL Draft process and it is something some NFL teams are taking to a scientific measurable level. NFL teams are creating a “social media profile” on NFL draft prospects as well as their regular football profile that included football skills on film, medical and character. This social media profile is looking to see what the prospects are tweeting about, what they are posting, etc. Things that they are looking for is how much does the prospect post something about football? Are there posts about drugs, weapons, or alcohol? Does the prospect post things degrading women? Some NFL teams will use pie graphs to show the percentage of things that the prospect posts about. How far are NFL teams going back to research? Well one NFL team that I talked to said that they looked all the way back at a tweet QB Jameis Winston had tweeted in high school. Yes, high school. “Our job now as scouts is not just see if the guy can play but every aspect of his life and that now includes his social media and what he post, as what his post is most likely what is important to him as a person. 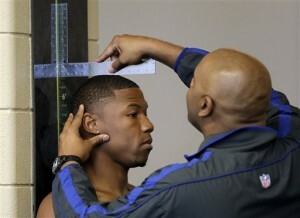 We are now taking it to a level of measuring that.” said one NFL scout. As we saw play out this past April draft with former Ole Miss and current Miami Dolphins OT Laremy Tunsil social media was hacked and a video and screen shot of texts were posted. Tunsil’s fall from the draft’s projected No. 3 pick to No. 13 cost him at least $10 million in guaranteed signing bonuses. True Tunsil’s social media profiles we hacked by what was believed someone who Tunsil had given access to his profiles in the past. With this social media analytics and data what NFL teams are trying to find out is, one does the prospect love football and two is he a good guy and can we trust him. Everyone need to know what they post on social media could be viewed differently by different people. True what someone post on social media doesn’t give the full picture but it is a tool that NFL teams are trying to use to make better personal decisions. Social media can be used for positives things like building one’s brand, marketing, engaging with fans, supporting causes and much more but it can have a negative effect as well and once something is posted it can’t be taken back even if deleted because with the notoriety someone will screen shot it and it will live on. With the 2016 NFL Draft in the books here is a look at the average height, weight, 40, Vertical Jump, Short shuttle, and 3 cone drill by position of players that were drafted. Highlights from Former NFL GM and Scout Ray Farmer talking about the NFL Draft and the process at Inside the League Event at 2016 NFL Combine. Ray Farmer was a 4th round draft pick, worked for the Atlanta Falcons as a scout, Kansas City Chiefs as Director of Pro Personnel, and the Cleveland Browns as General Manager. Right now we are getting close to the 2016 NFL draft but NFL scouts around the country are already hard at work on the 2017 NFL draft on college campus in what is called “Junior Days”. What are “Junior Days”? Well there are two scouting organizations that NFL teams subscribe to called BLESTO and National (National Football Scouting) each of these organizations is made up of scouts from different teams, and all except the New England Patriots “subscribe” to one of these services. Normally the college coach who is the pro liaison sets up the junior day in which the draft-eligible players for the next year take part in a workout much like a Pro Day just for these scouts. These junior days are normally scheduled during spring practice. Scouts do measurable, the player’s height, weight, hand size and reach, some school will allow their players to run the 40 but others won’t. The scouts will also have the players take the Wonderlic test which is a standardized test which is used to assess the aptitude of prospective employees for learning and problem-solving. The scouts also view film for the player’s junior year as well as background information and injury history. From there, only a single report is filed and shared with the other teams as part of the group, and then there is a meeting where the reports are shared with the member clubs sometime in late May. Once those reports are filled that is when people in the football business try to get their hands on those reports or just the grades. Even though all information from National Football Scouting and BLESTO are proprietary, agents, financial advisors, trainers, all-star game organizers, media members, and NFL draft gurus all try to get their hands on what is referred to as the “spring grades.” Once anyone gets their hands on these grades they will start contacting the players letting them know what their “spring grade” is. These grades are not set in stone and they sure change thru out the season but they are for sure a great starting point. The grade that either of these services gives a player the May before he plays senior season doesn’t have a huge effect on where the player is drafted a full year later but does have a good bearing if the player will get invited to the NFL Scouting Combine which is run by National and has input by BLESTO on who gets invited. Springs grades are important starting point for people in football business and the prospects. But there is always prospects who come off the radar like DE Ezekiel Ansah, Detroit Lions (Drafted 5th overall in 2013, no spring grade) and this year CB Quinten Rollins, Miami (OH) should be a middle round draft pick who also didn’t have a spring grade going into this season. Some schools allow their players to run in the spring for NFL Scouts. 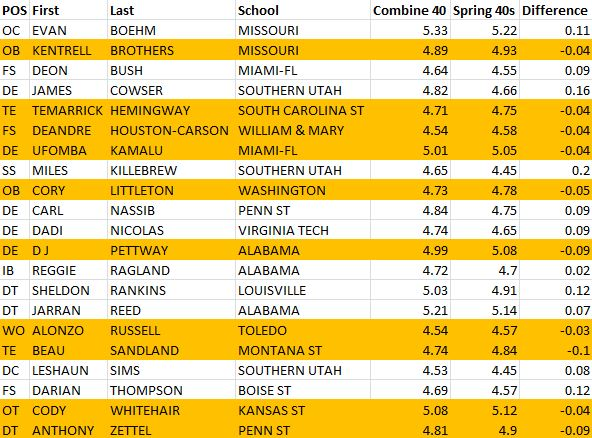 In this years NFL combine there were 21 players that ran for NFL Scouts in the spring and also ran at the NFL Combine. Only 10 of them improved their times and 11 actually got slower. 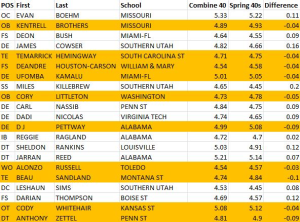 All 21 players trained at a combine prep facility, but at the end of the day, fast guys run fast. Plus as scouts and GMs will tell you by the time that they get to Indianapolis for the NFL Combine their NFL Draft Board is set. Most teams have around 180 players on their draft board so the NFL Combine is about confirmation and cross checking. At the end of the day “it is about ball” as one GM told me.